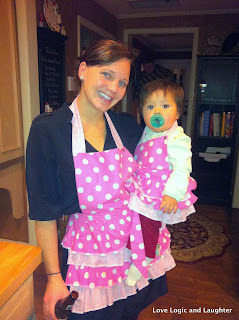 For Christmas I made Eliana and her Godmother (Aunt Lauren) matching aprons. Lauren loves to bake so she will hopefully use hers even without Eliana, but I thought it would be fun for the Godmother/Goddaughter to have matching items for when they play together. Little girls love to help in the kitchen so perhaps Aunt Lauren can teach Eliana a few of her baking secrets while spending some quality time together. They are lined with a coordinating pink flower fabric so if you decide to wear just the bottom half and let the top hang down it still looks pretty. I love all the ruffles! So girly!!! Lauren loves to entertain AND bake so I am certain she will make good use of it. 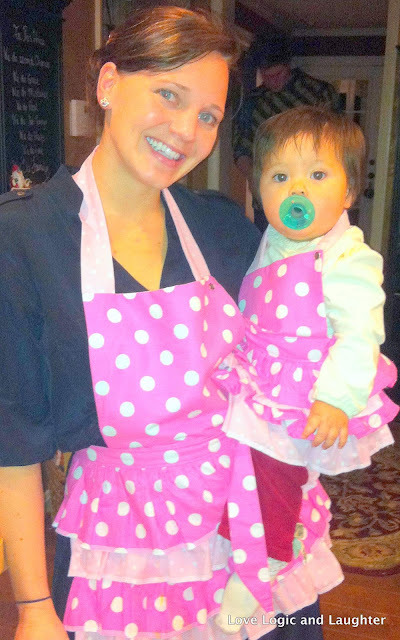 And how fun will it be for she and Eliana to wear their matching aprons while making mini pies. Yummy! I added my "homemade touch" (clothing labels) to give them a handmade look. The aprons looked pretty folded and wrapped up.